MACAU, Oct 18, 2018 - (ACN Newswire) - Macau Theme Park and Resort Limited ("MTPR"), a developer of leisure and entertainment integrated resort facilities in Macau, today unveiled its plans for its inaugural integrated resort project, Lisboeta, on Cotai, Macau. The unique Macau-themed integrated resort is the first of its kind, and will introduce many offerings new to Macau and the region, delivering an all-encompassing experience sure to entice guests of all ages, especially families and a younger demographic. A naming ceremony was held at the Grand Lisboa Hotel, Macau today, officiated by directors of MTPR including Mr. Arnaldo Ho, Ms. Angela Leong, Mr. Lee Wai Man and Mr. Li Chi Keung. The HKD5 billion project is located adjacent to the Macau East Asian Games Dome on 106,015 square metres of land, with a gross floor area of 141,035 square metres, including approximately 15,000 square metres of parking space. In addition, approximately 20,000 square metres of open space is reserved for outdoor events and leisure purposes. The Lisboeta's overall design concept pays homage to 'old Macau', incorporating details inspired by iconic buildings etched into the collective memory of Macau locals, such as Hotel Estoril, floating casino Macau Palace and New Central Hotel. The two thematic zones in the integrated resort, namely Retrospective Macau and Future Macau, aim to showcase the development of the vibrant city since the 1960s, as well as envision its exciting future and potential. Mr. Arnaldo Ho, founder of Lisboeta and Director of MTPR, said in his presentation during the media conference, "In recent years, we have seen many beautiful, modern resorts and attractions with all kinds of themes developed on Cotai. However, there is little to be seen of the original, authentic Macau which is characterised by the many architectural icons developed by my father, Dr. Stanley Ho. Therefore, my idea behind the Lisboeta is not only to evoke nostalgia for the old times, but also revitalise those memories of Macau with fresh new concepts. 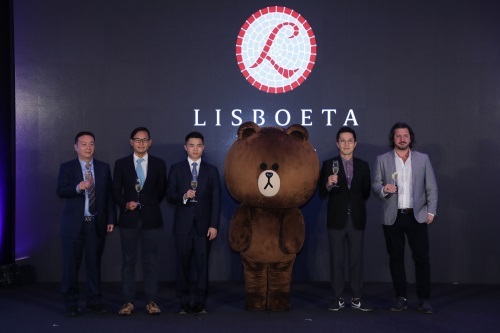 "The significance of the name Lisboeta, which means 'the citizens of Lisboa' in English, is twofold: it represents the deep bond between Lisboa and Macau, as well as the close ties between our brand and our patrons. Likewise, the Lisboeta is a project dedicated to the Macau people, who manifest the culture and heritage of this city. The integrated resort is set to open in 2020 as a premier integrated entertainment and leisure resort in Macau and regionally." The Lisboeta will offer 820 guestrooms across three hotel brands in a 12-storey hotel tower. Serving as a bridge connecting the Retrospective and Future zones of the integrated resort, the tower has incorporated Macau's quintessential architectural characteristics into the exterior design, such as the curved rooftop and facade mosaic of the Hotel Estoril. All rooms and suites will be operated by MTPR. The Lisboeta Hotel contains 574 rooms and suites with interior design evoking 1960s Macau, enhanced with modern twists to traditional elements such as the folding doors of Macau shops to reflect the evolution of Macau from the past to present. The rooms' family-friendly design will provide an overall homey ambiance. The first of its kind in the world, Maison L'OCCITANE hotel has 164 rooms and suites boasting designs inspired by Provence, the south of France from where the internationally renowned natural well-being product brand originated. The hotel offers a diversity of room types customised with themes based on L'OCCITANE's most iconic natural ingredients, namely Immortelle, Verbena, Cherry Blossom and Shea Butter - each illustrating classic Provencal charm and representing contemporary French elegance. The 82-room CASA DE AMIGO, which is created as the first themed hotel in the world that fully designed by LINE FRIENDS, offers an unforgettable unique experience with beloved LINE FRIENDS characters for the hotel guests, like visiting the home of LINE FRIENDS. Three uniquely themed guestrooms, namely "BROWN's room", "CONY's room" and "LINE FRIENDS' room", are available for guests to choose based on their preferences. These adorable guestrooms are decorated with splendid colours which are inspired by Portuguese architecture, and infused with a simple oriental beauty of Macau. In CASA DE AMIGO, memorable moments with LINE FRIENDS are guaranteed everywhere. The Lisboeta will recreate the former floating casino Macau Palace, which enjoyed a colourful history as a symbolic landmark in Macau, even attaining a feature in the 1974 James Bond classic film "The Man with the Golden Gun". The three-storey replica will be decorated with ornate Chinese carvings, wood moldings and lantern, all of which will be surrounded by an artificial lake. Including an exhibition area and a Chinese seafood restaurant, the Macau Palace will provide an impressive and reminiscent backdrop for the visitors touring around in the Lisboeta. Zip-line 388 is Asia Pacific's first urban zip-line attraction, and the first of its kind fully integrated with audio-visual enhancements for an extra-sensory experience. The 388-metre zip-line will begin on top of a 60-metre high purpose-built tower in the Retrospective Macau zone, where customers may enjoy views across Lisboeta before embarking on their gravity-defying adventure. 388 will operate day and night, 7 days a week. Indoor skydiving in Lisboeta, as the first in the South China region, will inhabit a fully frameless glass tunnel, offering players a seamless panoramic perspective. Using state-of-the-art technology from international wind tunnel company, Aerodium, which has constructed over 80 wind tunnels in 27 countries, the tunnel spans 4 metres in diameter and stands at 12 metres tall. This attraction is sure to deliver exhilaration and thrills with its maximum airspeed of 280 kilometres per hour. Emperor Cinemas will introduce Macau's very first IMAX and MX4D theatres to visitors of Lisboeta. Decorated with a glamourous Gatsby-themed design, Emperor Cinemas will also house two VIP and five regular theatres, totaling nine theatres and approximately 1,200 seats. Emperor Cinemas aims to guarantee a fully immersive movie experience to local audiences and tourists. The retail mall in Lisboeta will be divided into two thematic parts reflective of the zones surrounding the integrated resort: the outdoor nostalgic streetscape, and the indoor futuristic streetscape. The nostalgic retail area aims to bring the visitors back in time through its traditional architecture and stunning visual of the replica of Macau Palace nearby. The futuristic retail arcade, which includes a family-friendly food court, will be furnished in a sleek and modern style featuring a birdcage centrepiece. The Lisboeta will provide a vast array of food and beverage options, including a Chinese seafood restaurant and eateries offering authentic local flavours. It will also have a versatile function space and an indoor swimming pool. Mr. Arnaldo Ho concluded, "The Lisboeta will be a Macau-themed integrated resort guaranteed to bring happiness to Macau citizens and tourists, by offering a comprehensive experience filled with nostalgia, distinguished themed hotels, adventurous attractions and immersive cinema. The Lisboeta will be a forceful injection of unique tourism assets to Macau's portfolio for sustainable development." Macau Theme Park and Resort Limited is a developer of leisure and entertainment integrated resort facilities in Macau. Its inaugural integrated resort project under development, Lisboeta, is located adjacent to the Macau East Asian Games Dome on 106,015 square metres of land on Cotai, Macau.